Body scrubs have come a long way since the days when rough particles left your skin a little raw and a messy residue in the bath, and now with the permanent ban of microbeads, how do you find a good body scrub? The no pain no gain philosophy used to apply, but no more, because quite frankly some scrubs hurt and weren’t pleasant to use. Some of you may think it’s a product you don’t need, but actually I think it’s an essential one to help increase circulation in the body, and makes sure your skin is properly cleansed rather than being rinsed in the shower. 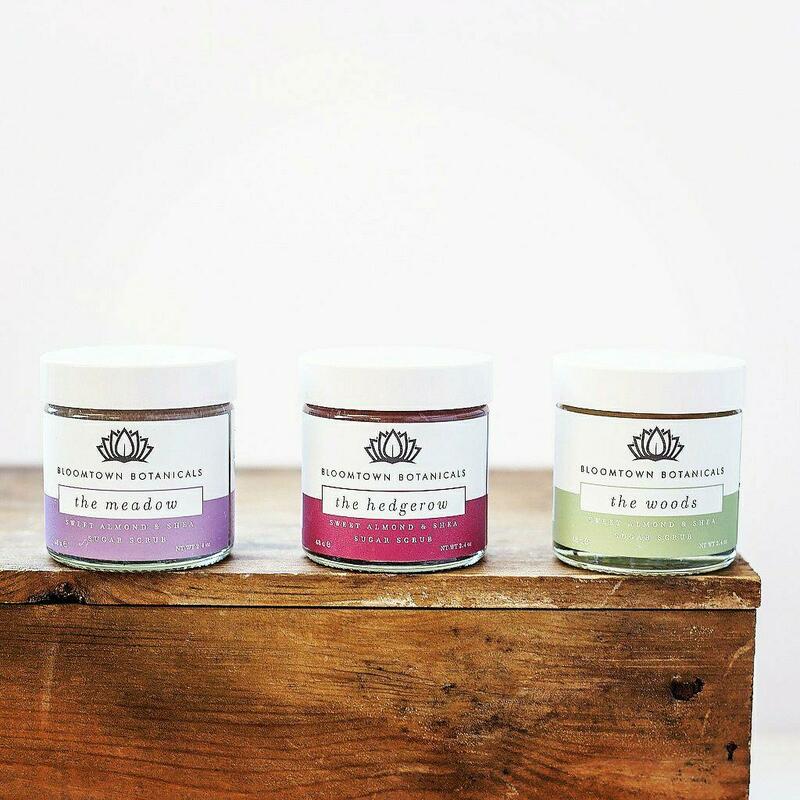 Bloomtown Sugar Scrubs do three things: cleanse, exfoliate, and moisturize and it really does all three. They come housed in beautiful glass jars 68 g (£6.50) or 285 g (£12), or are available in a trio for £17.50 (choose which scents you like). The scrubs are as the name says made from sugar, and also use some of my favorite ingredients such as shea butter and sweet almond oil. When I see a product with these in, I know it’ll be good. I’ll be honest when I first tried the product (from Little Known Box that I was reviewing) I didn’t know what to expect and just hoped the product wouldn’t be too harsh. I was immediately impressed as the sugar scrub gently exfoliated without scratching, and didn’t leave my skin dry, but left a light film of oil on my legs. When I got out of the bath, my legs were still moisturized and I didn’t feel the need to use anything else. This is simply the best body scrub you can find on the market to date, and I have used many including some very expensive ones, which actually put me off using body scrubs. Thankfully this product has restored my confidence! The sugar granules are small, and once they come in contact with water they soften and dissolve. Body scrubs are essential for those who are battling cellulite or who have poor circulation (stimulates sluggish skin) as they help remove the dead skin layer and toxins (such as sweat) that build up that aren’t as easily removed with soap and water, especially around the feet, knees, and also the hands. Ideally use the scrub after dry brushing, and afterwards use a toning oil or serum if you have cellulite concerns. If you are a self tan fan, you should always exfoliate to ensure you get a smooth application, and this scrub is ideal as it leaves the skin moisturized. For those who have dry hands or nails, using this as a scrub each night, especially around the cuticles will help the absorption of hand creams, and stops the cuticles from getting flaky. If you use a lot of nail varnish, nail varnish remover can dry out the nails easily, so using this scrub with help exfoliate and also moisturize around the cuticle area. Bloomtown Rewards ~ where you accumulate stars (points) from purchases or sharing on social media which are converted into gift vouchers. Jars for Stars ~ Return any glass jar or bottle with original lid and receive 50 stars in the rewards scheme. Bloomtown Eco Challenge ~ Simply replace one food or beauty product with a single-use plastic and/or palm oil-free alternative. 2. Before Jan 30th, post a picture and brief description on Facebook, Instagram or Twitter and tag it with #BloomtownEcoChallenge to be entered into a monthly draw for a £25 gift voucher.